Last week I finally made soft pretzels. I say "finally" because it's something I've wanted to do for a very long time. I've made them before, but always the easy way -- by baking only. And those turned out okay... but never developed that dark pretzel-brown color and the crust never tasted pretzely. They were more like salted breadsticks. 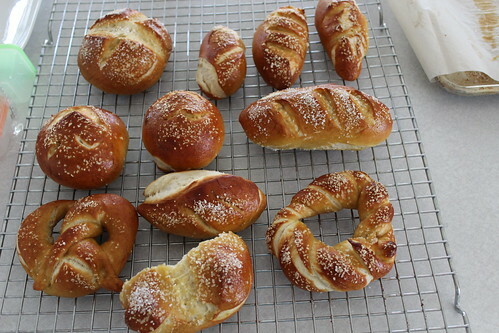 ;) The "real" way to make soft pretzels involves boiling the dough before baking and that step always scared me away. Anywho... I finally put my big girl pants and gave them a shot. Gorgeous pretzels. That taste pretzely. One thing I know: I hate rolling dough. I always have. Rolling pins and I don't get along. Not that pretzels need a rolling pin, but trying to get them into nice little loopy knot shapes was more work than I cared to commit to, so after trying one I moved on to other shapes. Ethan was very fond of the twisted wreath one, I rather liked the little loaves and round bun pretzels. 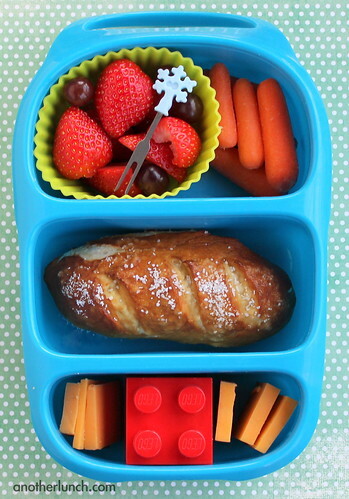 All this to say, pretzels made appearances in all of Ethan's lunches last week. He also took them for snack a couple days. Now this is the trouble with soft pretzels: like most fresh breads, they are best when eaten straight off the cooling rack. Warm and fresh. But the troubling thing with pretzels is that if they are salted, that salt will pull moisture out of the bread the longer it sits. So by the next morning the pretzels looked a bit droopy. See how it's kind of bloated looking here? Thankfully Ethan still loves them just the same. That same day Paige had this lunch, also packed in a Bynto box. She's a not a huge fan of soft pretzels, especially ones past their prime. Lunch for Ethan the day after. The homemade pretzels are now two days old. They are looking a bit sketchy and quite unappetizing, but Ethan is still a fan. I used the large box from a Laptop Lunches Bento Buddies set to take the place of the two medium sized boxes that are usually on the left side. 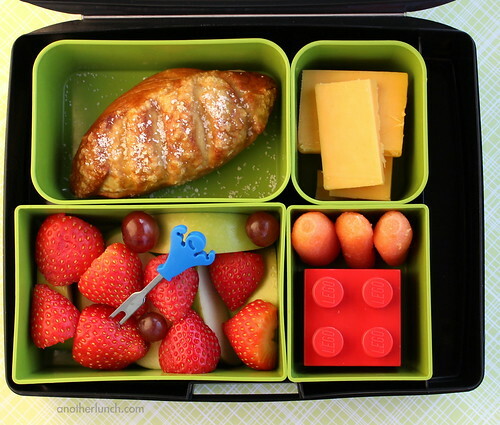 In that large Bento Buddies box she has a ham and cheese sandwich on multigrain. 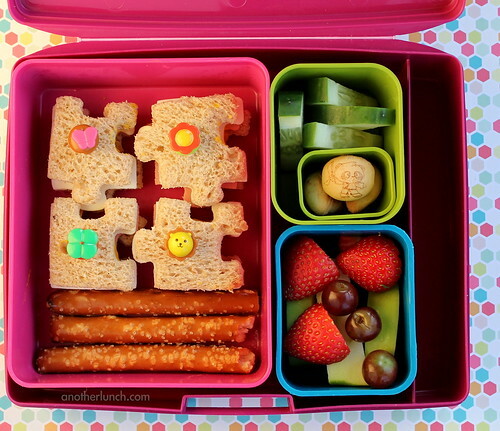 The sandwich was cut using a Lunch Punch puzzle cutter, and then the small puzzle pieces are secured with little bento picks. A couple pretzel rods fill in the bottom. The sides are cucumber slices, a few Hello Panda cookies, and another fruit party with apples, strawberries, and grapes. Melissa, would you be willing to share the pretzel recipe? It might be fun to try. I tried to make "real" pretzels a few months ago - it did not end well lol. I will have to check out Alton's recipe with your tweaks. They look amazing! Well, Foodie Mama, last week I made them again and they didn't turn out as well. Not even close. I used the same recipe and everything, I'm not sure what went wrong. But when I got to the boiling stage the dough was becoming a gooey sticky mess and not holding shape at all. It was awful! I ended up still baking them and Ethan ate them, so at least it wasn't a total waste. But I certainly did not take pictures of any of those lunches. LOL! If that had been my FIRST experience with making pretzels I doubt I'd ever try it twice! 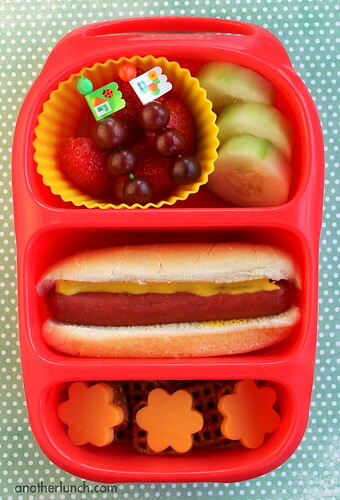 Transportation themed lunches | beep! honk! zoom!